I cut it half and scuffed away all seeds and stringy tissues with a tablespoon until inside is nice and clean. Oil up the squash with some sesame oil in and around. While doing this, I had my wife preheat the oven to 325 F. I baked it face down for 45 minutes or until the squash is soft enough for scrapping. [You may add 1-inch water]. Slice a green and a red pepper, garlic, and put them together with cherry or grape tomatoes, and whole white or mini Bella mushroom. (You may use any varieties of peppers depending on your taste- Jalapeño, Cayenne, Sriracha, Habenero, Anaheim, Serrano, Carolina, or Ghost pepper.) Please, remove seeds from peppers; else, everyone inside the house will be coughing hard when you bake them. Spread them on the baking sheet and toss some olive oil, Himalayan sea salt, and fresh ground black pepper and bake. Once baked, scrape all the good (yummy) spaghetti looking meaty stuff with a fork and put it separately in a bowl. Now, it is time to fill the squash with layers. Add black beans, sweet corn, salsa, and cover them with a thin layer of spaghetti squash strings. [Seriously, I do not know what it is called.] Also, baked goods can be added at this time but I like them separately. Add a layer of shredded cheese on top of them and repeat the process until it is filled on the top. Throw some extra cheese if you like it more cheesy and spread some bacon bits. Put the squash face up and broil them for 4-5 minutes. Lo and behold! 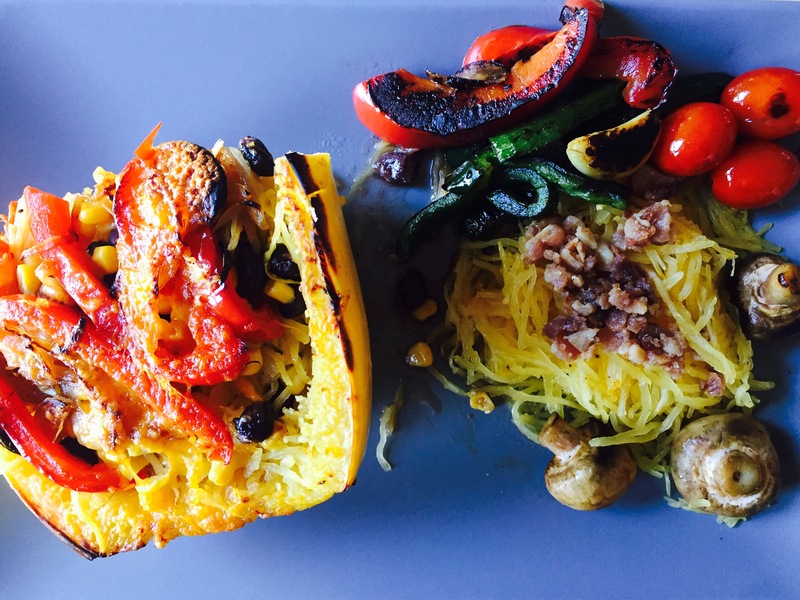 Your spaghetti squash is ready. You may serve it while it is still hot but beware of burn. I am not responsible for temperature and or hot pepper burn. Next Next post: Why OK?